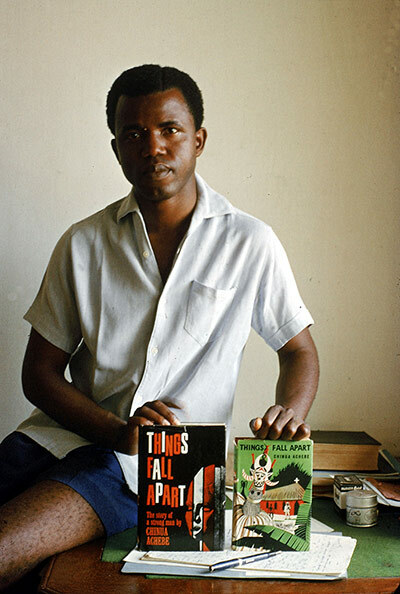 Chinua Achebe‘s mission statement, by his own admission, was to “set the record straight”. His seminal work, Things Fall Apart, was the first in an African trilogy that set about establishing the validity of life in tribal Nigeria in the late 19th century, before the “civilising” colonialism of Christian missionaries arrived. Achebe paints a picture of village life that is vivid, poignant, but also brutal. With no judgment or steer as a narrator, he succeeds in presenting a community that is robust, with strong mores and religious values, and morally upright characters trying to do their best. He succeeds so well that despite also being shown this life’s cruelty, the reader is left reeling with sympathy when the Christian missionaries come to the village and impose their British colonial system, which stamps the old life out as one would kick over an anthill. As an African Arab growing up in post-colonial east Africa, I had not read before an indigenous interpretation of regional history that wasn’t either a non-critical celebration of pre-colonial past, or a wretched condemnation of it as one that must be deficient if it succumbed so easily to invasion. Achebe was the first African writer who painted a non-romantic picture of this tribal life without apologising for the bad, or praising the good. Yes, tribal society Africa was strong and functional, but Christian missionaries would not have made any inroads were there not dissatisfaction with its brutal justice, ethnic discrimination and religious rigidity. 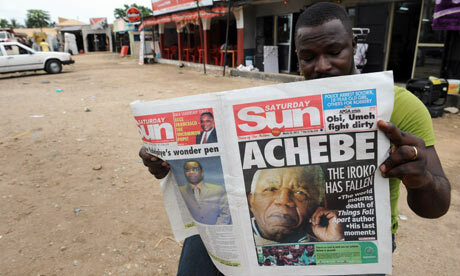 Achebe’s writing isn’t anything as banal as cultural relativism – something he has been accused of – but a powerful refutation of the fact that before the white man, Africa was a “blank sheet of civilisation”. Once things did fall apart, with the west fully taking the reigns of governance either directly or by proxy, what replaced the old way? An uncomfortable mix of modern and traditional that still ended in tragedy. Perhaps the most relevant of Achebe’s works to my generation is No Longer at Ease, the second book of his trilogy, which powerfully exposed the difficulty of navigating a world where one is expected to partake of western secular education and all the values and privileges that comes with it, and still be hostage to the commanding beliefs of one’s own culture. It is a heart-wrenching account of the grandchild of the main character in Things Fall Apart, who joins the Nigerian colonial civil service after receiving a British education but struggles to escape the conflicting mores of his family – a tragic modern protagonist with a foot in both camps. subsistence of villagers were tied to religion. When the new colonial administrator tries to co-opt the chief priest, the latter rejects the offer and is thrown in prison. In rebellion and religious hubris, he refuses to call for a harvest and the yams rot in the fields. There ensues a famine that results in many converting to Christianity in rejection of a system that the white Christian missionaries convinced them had allowed them to starve. It is a simple narrative of the practical difficulties in governing societies under two conflicting political systems rooted in incompatible values. There are still echoes of this in the present, where western-style democracy is offered as an absolute panacea for all the Orient’s ills. This African trilogy is still relevant today; western intervention is routinely justified under the guise of moral concern, and political turmoil is often sparked by an imposition of western-style governance. In our increasingly global world, civilisational superiority can also be cloaked in ostensibly benign concepts: the promotion of democracy, self-determination, the liberation of women. Achebe’s memoir begins with the Igbo proverb: “A man who does not know where the rain began to beat him cannot say where he dried his body.” His work tried to isolate when the defeat of colonised societies began. It is an important question, if we are to carve a path independent of post-colonialist ushering into “civilisation”. Achebe was a visionary who traced the modern tragedy of the dehumanising effects of cultural arrogance and absolutism, and how they are manifested as the moral arms of cynical campaigns still at work today in Iraq and Afghanistan. Indeed, the missionaries are still coming to the village.